After a night’s rest, the party resumed a game of debate over next steps. Schemes circled between them like a detritus caught in a sewer drain. Losing patience, Abor announced his intent to scout the village again to know the outcome of the uprising. He leapt over the railing and swam swiftly upstream. Hours later, Abor return, easily climbing up the wooden ship and over the railing. In his stunted lizard lisp, he relayed how many more lizardfolk lay dead with gogglers apparently holding a celebration. Surely the slaughter required in putting down the rebellion necessitated a rapid harvesting of mysterious glands the gogglers used as an intoxicant of which they then indulged. The party felt an urgent pull to rush back to the village to strike while the gogglers were incapacitated. They returned via the crumbling white road and gazed over the village as dawn broke and the gogglers retired for rest in the cave. Only five guards remained out in the village. Tienarth, Ferris and the pirate with the nigh unpronounceable name, Kuhvirhuk, crouched in bushes to the south of the village. Azrak and Ghevont hid themselves to the north. Abor strolled cautiously into the village near the cave mouth. He raised his hand and Ferris attempted a silent approach towards a guard. The guard whirled. The surprise was ruined. Four of the guards were cut down quickly. One attempted an escape to the cave. Ferris caught him at the mouth and cut him down. 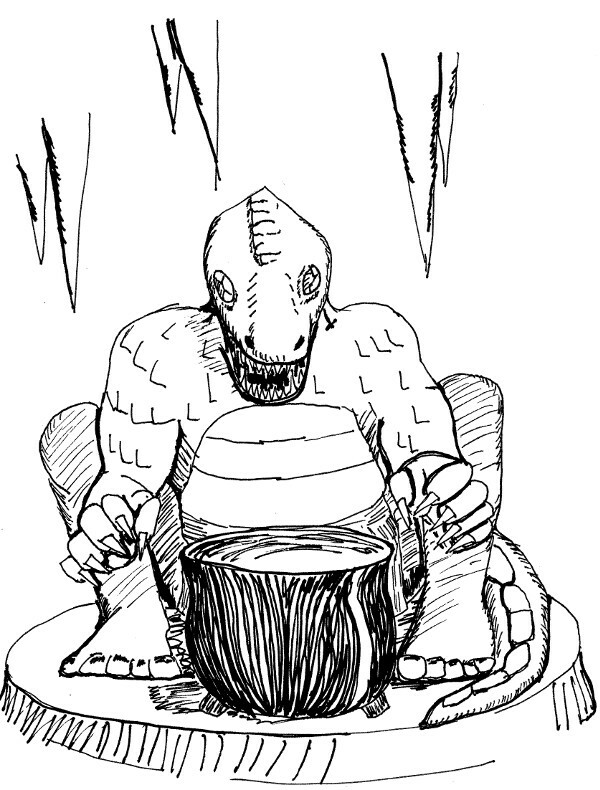 His eyes adjusted quickly and he faced a giant brass statue of Ghot crouching over a cauldron. Lizardfolk kneeled before the statue as a goggler with a whip made ready to lash them. To the left, four more gogglers encircled a cowering lizardman as they tossed a knife past his head repeatedly. The entire crew weighed into battle. The lizardfolk slaves immediately turned on their masters, too. The goggler with the whip attempted to slink away through an archway but was caught and killed. Catching their breaths, they noticed the sparkling emerald eyes of the Ghot statue and the many offerings of food at his feet. A low, sputtering fire in the cauldron jerked shadows over the twenty foot monument, producing an illusion of movement. They noted wide arches flanking Ghot, leading south and east. Choosing the eastern path, they found dried blood spilled over the edge of a stone altar and filling engraved lizardman runes. A pungent stink of death filled the chamber. A trail of blood smeared southward through an opening in the cave diving downward into darkness. A finished doorway out of the rough cave lead east, through which they crept. The short passage ended in a door. Ferris discovered a trap he easily disarmed but was confused by the lock. Light escaped from beneath the door. Ghevont pressed his face to the cold floor but was unable to see anything underneath the door. Suspecting an ensuing battle with goggler spellcasters, Ghevont cast a silence spell on a pebble and then rolled a handful under the door. Immediately, Azrak smashed the door down to find a small room beyond with a single goggler wearing an apron. Azrak grapples him intending interrogation. Ghevont begins bashing the goggler, which perterbs Azrak. Owing to the silence, communication was difficult, doubly so since Azrak struggled to keep hold of the goggler. He kicked at Ghevont to stop to no effect. Ferris dashed into the room to find the silence pebble with no luck. Presently, the goggler slipped free and attempted to run away. Ghevont easily crushed his skull from behind before he made it into the altar room. They retreated into the room and closed to door. A search turned up two potions and a sack of 9,000 platinum pieces, a load of nearly 200 pounds and not easily carried.